Minecraft isn’t exactly known for its killer, amazing graphics. However, there are ways you can get around this. There are a ton of mods out there that allow you to make the graphics look much more appealing when you’re playing the game. While some of these mods don’t really seem to improve the look of the game, Acid Shaders Mod is one of the few that does. This mod is based off of the GLSL Shaders Pack mod, among a few of the mods that were. Each of these mods allow Minecraft a new look. This is done by changing and adding in new textures, shadows, colors, shades, lighting effects, and other types of graphics. There is something special about the Acid Shaders Mod for Minecraft though. If you couldn’t guess by “Acid” in the name, you’re going to get some psychedelic effects from using this mod.It creates this weird effect by warping far-off areas by basing it off of the sin function in the game, meaning the function that measures areas. You could say this mod gave up on trying to be realistic and went full scale weird; but it works. Don’t do drugs kids, just play this Acid Shaders Mod to get your trippy fix. If you’re someone looking for a shaders pack to make your game seem more like the real world, this one probably isn’t for you unless you’re looking to view the world through Acid laced glasses. You might also want to be cautious if you are someone who becomes easily nauseated or easily motion sick. If you think you’ll be fine, then go right ahead! It definitely is a unique mod, there’s no doubt about that. For the players who want to see something new when playing, this is the shader pack you’ll fall in love with. 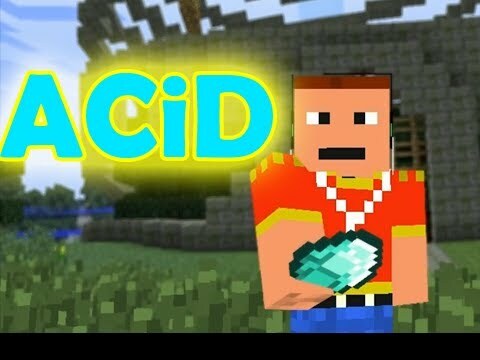 Put the jar file of Acid Shaders Mod into mods folder and then run Minecraft. Done!